You know what I was doing over weekend, don’t you? 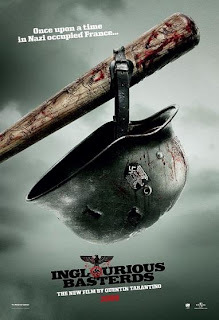 Naturally, watching the latest QT, Inglourious Basterds, with Anna from Diary of an Eccentric. Ok, you want a real review? Go ahead, check it out at War Through the Generations. You know I gave it a great review, but what did Anna say? 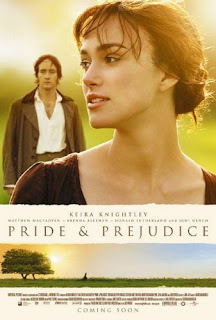 Focus Features’ Pride & Prejudice stars Keira Knightley and Matthew MacFadyen and was released in 2005. What’s to love about this version of the classic Jane Austen novel is the performances, the score, the cinematography, the screenplay adaptation, and everything. Keira Knightley plays Elizabeth Bennet and she does a beautiful job expressing the character’s emotions, prejudices, and nuances, and Matthew MacFadyen, who plays Fitzwilliam Darcy, plays off of her so well. The chemistry between the two actors sizzles on the screen, and the tension between the characters is palatable. My love of piano music is catered to in the score of this movie from the scene with Elizabeth looking out over the countryside on her way to Pemberley with her aunt and uncle to the consistent pianoforte playing by the various characters. While there are scenes from the book that are not in this movie, the pacing is perfect. Knightley easily portrays Elizabeth’s fire and her love for her sister. MacFadyen’s performance is equally captivating as Mr. Darcy from the touch of Elizabeth’s hand and the clenching and unclenching of his fist to the longing gazes he casts in Elizabeth’s direction. The supporting cast is brilliant from Donald Sutherland as Mr. Bennet to Dame Judi Dench as Lady Catherine de Bourg, providing moments of laughter and anger. Some of the best scenes are when it rains and Darcy professes his ardent love against his better judgment, the witty repartee between Darcy and Elizabeth at Rosings, the first dance between Darcy and Elizabeth, and the short exchange between Darcy and Bingley when he visits Jane after a long absence. The best scene of course is when Darcy and Elizabeth meet in the field early in the morning after his aunt visits late the previous evening. Check out this P&P video set to music. Check out the trailer. Focus Features’ Pride & Prejudice (2005) receives 5 bags of popcorn from me and makes the first movie for the Everything Austen Challenge. 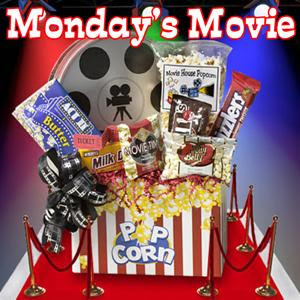 This is my first Monday Movie Review, which is sponsored by Sheri at A Novel Menagerie. The movie version of Emily Bronte’s classic Wuthering Heights may confuse viewers who recently read the book or have the book committed to memory. I distinctly remember the narrator, Lockwood, in the book, and was rightly confused when the movie began at the ending of the book when Heathcliff attempts to force Catherine Linton (Edgar Linton and Catherine Earnshaw’s daughter) to marry Linton (Healthcliff and Isabella Linton’s son). Unlike the book, Heathcliff has a softer side, which only turns darker when Catherine’s brother, Hindley, takes over the estate after the death of Mr. Earnshaw. Hindley was vicious to Heathcliff as a child when his father brought the gypsy home. Rumors circulate that Heathcliff is Mr. Earnshaw’s illegitimate son, and Hindley wants to restore his family’s reputation. The relationship between Catherine and Heathcliff grows exponentially from when they were children, and through a sped up storyline and camera effects, their adult-like relationship and wild demeanors are revealed–romping on the moors, becoming intimate, and continuing to engage in childish pursuits of spying on the neighboring Lintons. What’s missing from this movie adaption is the searing hatred Heathcliff exudes on his fellow man and particularly on Hindley. Eventually this hatred and darkness also descends on Catherine after she marries Edgar Linton. More than just Heathcliff’s edges are softened in this adaption. He’s kinder to Isabella, Catherine, and the subsequent children. Heathcliff’s ending is much more sedate than the downward spiral in the novel. Catherine also is a much softer, more lovable character in this adaption. She could be just as harsh as Healthcliff at times. The ending also is more hopeful. Staying true to the novel may not have been the aim of this movie adaption. I’ll rate it 3 out of 5 bags of popcorn because the actors were well selected, the storyline was gripping, and the scenes were gorgeous. Check out Jess McCann, Author of You Lost Him at Hello (my review), on Good Morning America, Feb. 13! On Jess’s Website you can watch her recent appearance on Fox Morning News!